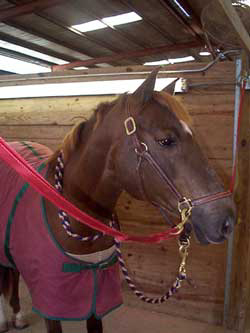 Magic was purchased at the age of six as a first horse and Christmas present for Katie and Jeffrey Katcher. Whenever it was time to ride the horse, homework and chores were done like “magic,” so he came by his name honestly. Magic was a perfect first horse. He showed great patience when small hands braided flowers into his mane, put silly hats over his ears or fumbled with hoofpicks and brushes. Magic understood that kids sometimes bounce around in the saddle and packed them around safely and with grace. Magic even knew to stop when little bodies became dislodged or landed in front of the saddle over a jump. Magic was a great comfort to Katie when she became ill with brain cancer. Although she couldn’t ride, trips to the stables with a huge bag of carrots were a big highlight between hospital stays. After Katie passed away and Jeffrey grew too tall for Magic, he taught many children to ride where he was stabled. Magic enjoyed the opportunity to go to shows and bring home buckets of ribbons from the novice hunter ring. After foundering two years ago, Magic made an almost complete recovery until suffering a setback last spring. Magic now spends his time enjoying his retirement, playing nanny to the family’s weanling, and convincing his veterinarians that carrots are the cure for this terrible disease.